Now that they're packing touchscreens and backlights, eReaders have enjoyed a bit of a resurgence as of late. And LG hopes to keep the ball rolling with its flexible ePaper technology that's now available in the surprisingly thin and light Wexler Flex One. 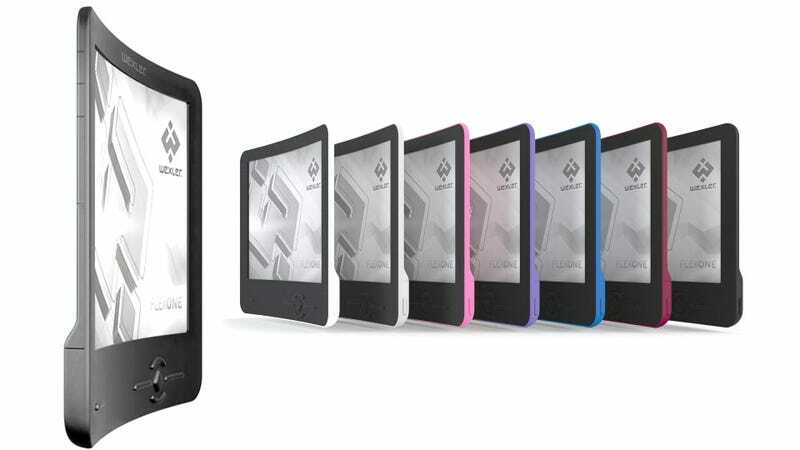 Yeah, Wexler isn't exactly a name brand when it comes to eReaders, but the Flex One is still worthy of your consideration if you're on the hunt for a device that weighs just 14 110 grams and measures a mere 0.16 inches thick. For comparison, the Kindle Touch weighs in at a hefty 213 grams and is a plump 0.4 inches thick. That's quite a difference. The Flex One's ePaper display also has a resolution of 1024x768 compared to the Kindle's 800x600, although you'll have to settle for navigating with a directional pad instead of a touchscreen. Update: The Flex One actually weighs in at 110 grams and is 0.16 inches thick at its thinnest point. Not across its entire body. So it's better to compare it to the latest generation, 170 gram, Kindle, instead of the Kindle Touch.